Pioneers in the industry, we offer banner stand, exhibition banner stand, roll banner, x banner stand, roll up displays and retractable banner stand from India. In order to beat the competition and stand tall in the market, we are engaged in offering Banner Stand. This banner stand is designed by our highly experienced professionals by using modern techniques & quality colors in strict adherence with the set norms. Our offered banner stand is acclaimed for its smooth edges. We offer this banner stand to our customers as per their needs at reasonable prices. Collapsible, Portable and re - usable banner stands. We are counted amongst the leading trader, retailer and supplier of premium quality Banner Stand. Our professionals design this banner stand with perfection within the stipulated time frame by using best quality of material. 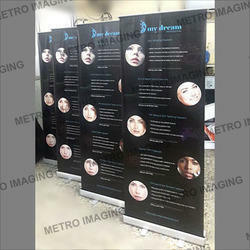 Our banner stand can be customized in accordance with the requirements of customers. Also, this banner stand is well checked before showing to the customers in order to assure its quality. We are a prestigious firm, engaged in trading, retailing and supplying the best in class Banner Stand. 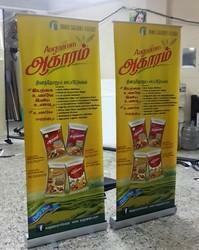 Offered banner stand is checked before providing to the customers in order to assure its quality. This banner stand is used in different commercial and corporation region promotion purpose. Also, this banner stand is highly appreciated by our customers due to its easy installation. 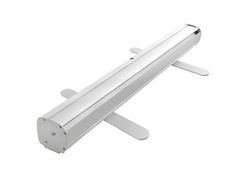 Premium model product comes with Heavy duty carry bag and made from thicker aluminium alloy components. In order to uplift and preserve our prestige in this domain, we are offering qualitative Banner Stand. Easy to install in various malls for promoting the brand, the entire range of banner stand is designed by our well-versed professionals in an effective manner with the help of sophisticated technology in observance with the market norms. 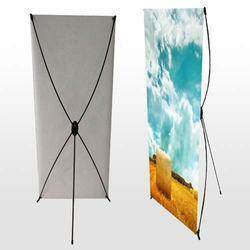 This banner stand is acknowledged for their quality and durability in the market. This Roll up display is designed by our highly experienced professionals by using modern techniques & quality colors in strict adherence with the set norms. Our offered banner stand is acclaimed for its smooth edges. 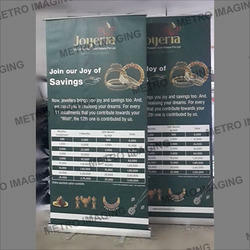 Custom digital printed retractable banner display stands are used at exhibitions, events, promotions, parties, at places of business and much more, to attract attention to a product or promote an event . For advertising solutions or for simply displaying product information, these custom printed retractable banner display stands are the best. Custom digital printed pull up banner display stands are used at exhibitions, events, promotions, parties, at places of business and much more, to attract attention to a product or promote an event . For advertising solutions or for simply displaying product information, these custom printed retractable banner display stands are the best. 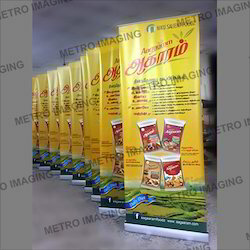 Offered banner stand is checked before providing to the customers in order to assure its quality. This banner stand is used in different commercial and corporation region promotion purpose. Also, this banner stand is highly appreciated by our customers due to its easy installation. Our professionals design this banner stand with perfection within the stipulated time frame by using best quality of material. Our banner stand can be customized in accordance with the requirements of customers. Also, this banner stand is well checked before showing to the customers in order to assure its quality. 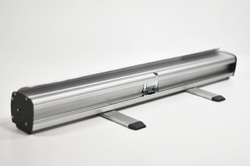 Looking for Banner Stand ?